Great for you, bad for bugs. Property Shield Pest Control is committed to providing the best residential and commercial pest control possible. Bed bugs, rodents, weeds and more! We are what you have been looking for! Property Shield is a locally owned and family operated company specializing in the management of pests, weeds and harborage sites (where bugs live) through cutting-edge environmental controls & GREEN pest practices. We have our own children, pets and farm animals. We love them! We want to provide them, and you, with the safest home possible. We are passionate about family, pet and eco-friendly application. We have worked with industry leaders and innovators, like Rockwell Labs, to bring the Inland Northwest organic and family friendly pest control products and ensured that they are legal in the state of Idaho. We love living in our small town in the Idaho Panhandle. We believe everyone should receive “small town service!” When you call us, you will speak to an owner. When we come to your home, an owner will help you make a property specific plan and your service will be performed by that same person. Real, personal care! We take the time to talk to you at each appointment, we want to know specifically what is going on at your home. We tailor each service to the current conditions and issues. We use cutting-edge application tools, equipment, and techniques. We truly enjoy what we do. This means we are happy to do what it takes to succeed. Bottom line WE KILL BED BUGS. At this point you or someone you know has probably had bed bugs. 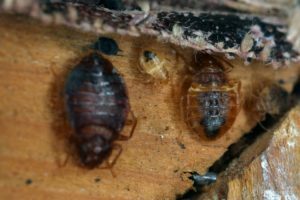 Bed bug infestations are on the rise and there is no sign of them slowing down. That is the honest truth. As Pest Management Professionals we spend hours and hours each and every year studying and accumulating more information on the best ways to take care of pests. These classes are regulated by the EPA and other agencies to ensure their accuracy. We then put the practices to work. Over the years we have developed a bed Bug Protocol that works! We are good at it and it is far more cost-effective than any other company you will find. Why? Just because we can get someone to pay a high price does not make it right. We charge a fair price. That is all there is to it. The most recent studies show bed bugs becoming resistant to heat. This is occurring because bed bugs with a thicker cuticle are surviving treatment and breading more bed bugs with thicker cuticles. The “heat only” outfits are now becoming the “mostly heat” outfits. We have a specialized protocol that eliminates the need to turn your house into an oven. We truly enjoy eliminating bed bugs and saving you money!